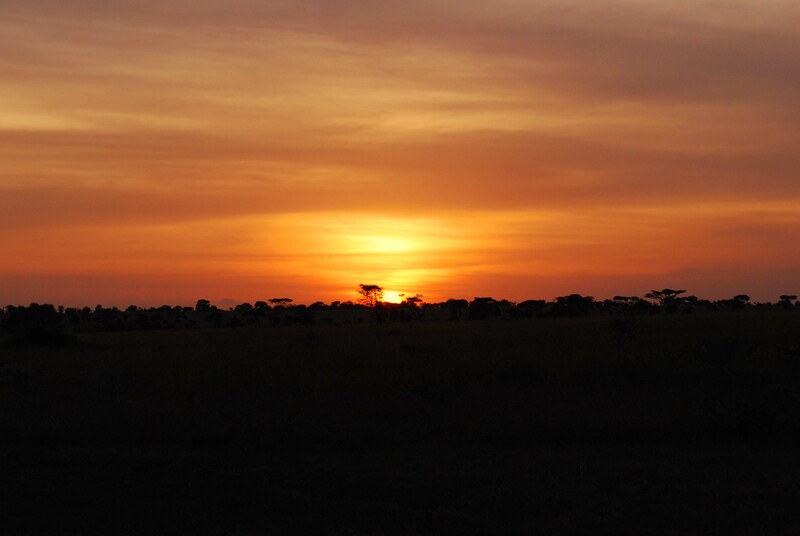 Sunday, March 24 – Leaving the Serengeti and an incredible visit to a friend’s boma…. 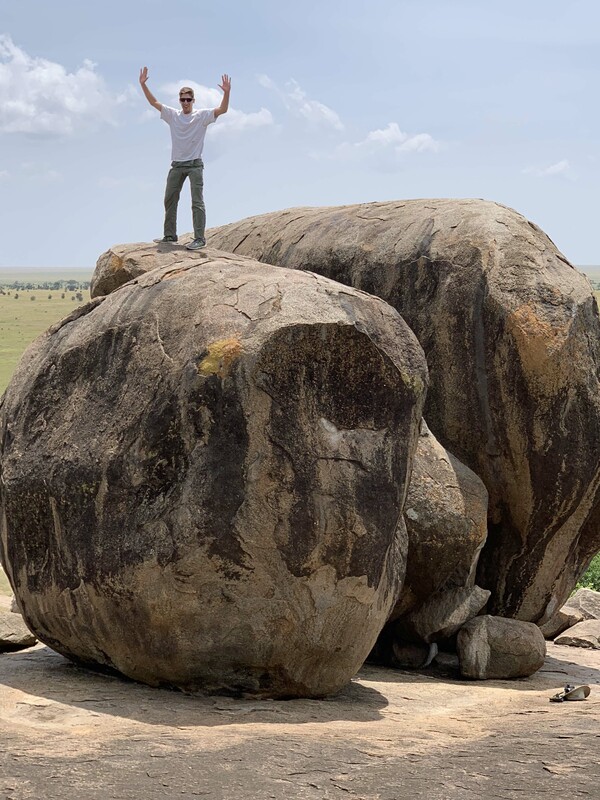 It was our last day in the Serengeti as we’d be heading back to Karatu today, but we still had at least half a day of exploring before we left. We were up early for breakfast which was a delightful affair and made even all the more so by the presence of everyone’s favorite, pumba bacon (no longer an oxymoron, by the way, given all of the healthier versions of bacon we have in the markets) much to our appreciation. Though we had wanted to be on the road early, I think we all enjoyed sitting just a little longer for the meal today as it would be our last in camp. The camp, Tanzania Bush Camp, has exceeded everyone’s expectations, I believe, and have been here several times before, they have never let me down. The staff are incredibly friendly and have a willingness to help to goes well beyond. I’d highly recommend them to anyone setting up their own itinerary here or making suggestions to someone else. There’s little question that you feel fully pampered here at camp, but this is one of those times where it truly makes a difference and is more a part of the culture than anything else. 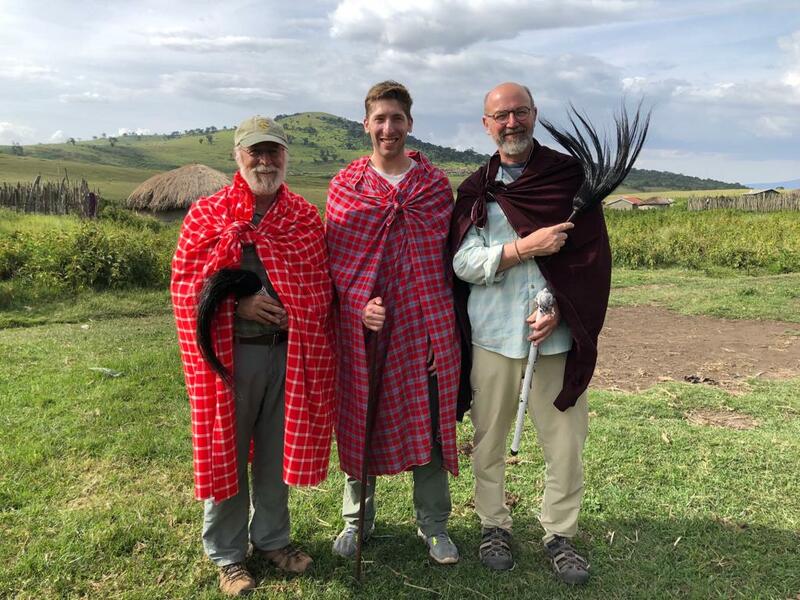 We headed off once again in the direction of the Maasai Kopjes, but looped around towards the village of Seronera before reaching them. Some of the sights included a hippo pool with virtually, and literally, tons of hippos basking in the morning sun, constantly flicking mud and water onto their backs and occasionally rolling completely over (a real feat for an animal this size) to prevent from becoming sun burned which they can easily do if they’re not too careful. 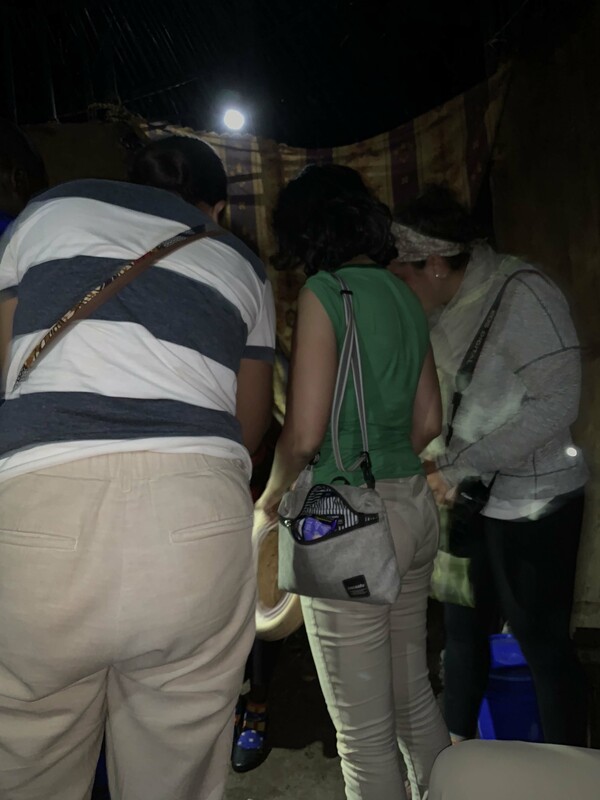 The most striking thing, as you might imagine, is having all of those hippos in a pool and the accumulation of their feces and urine, which makes for a pretty ripe concoction and something that you will smell long before you hear or see them. Not that you would ever consider having lunch next to such a pool for the sole reason that the hippo is the deadliest animal in Africa and can run far faster than you would every imagine, but the stench would cause you to so quickly lose your appetite that it could be marketed as an incredibly successful, though not popular, weight loss program. 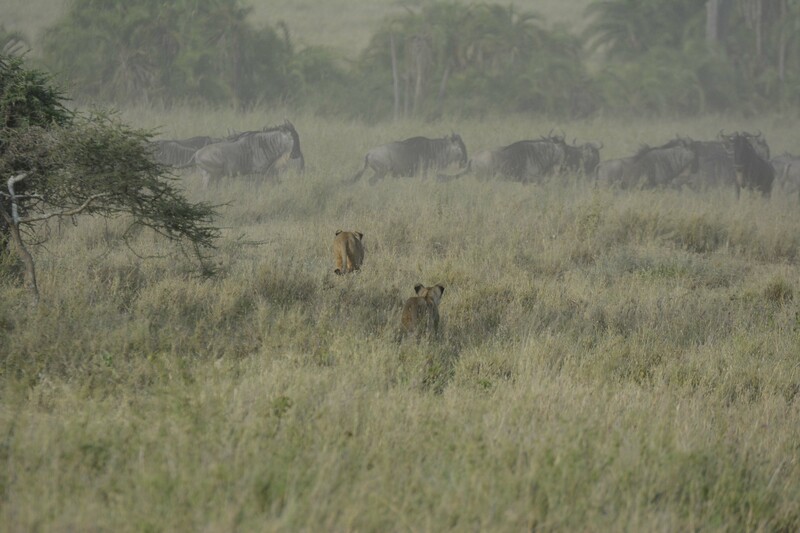 We came upon a huge heard of wildebeest and zebra at one point that were making their way to a small river crossing to drink, but looked very, very nervous and it became readily apparent why when we spotted four lionesses moving in their direction and clearly on the hunt. They were positioning themselves for a kill and very quickly things became very tense and exciting, but somehow, they let the bulk of the herd through, leaving some stranded zebra by the water. 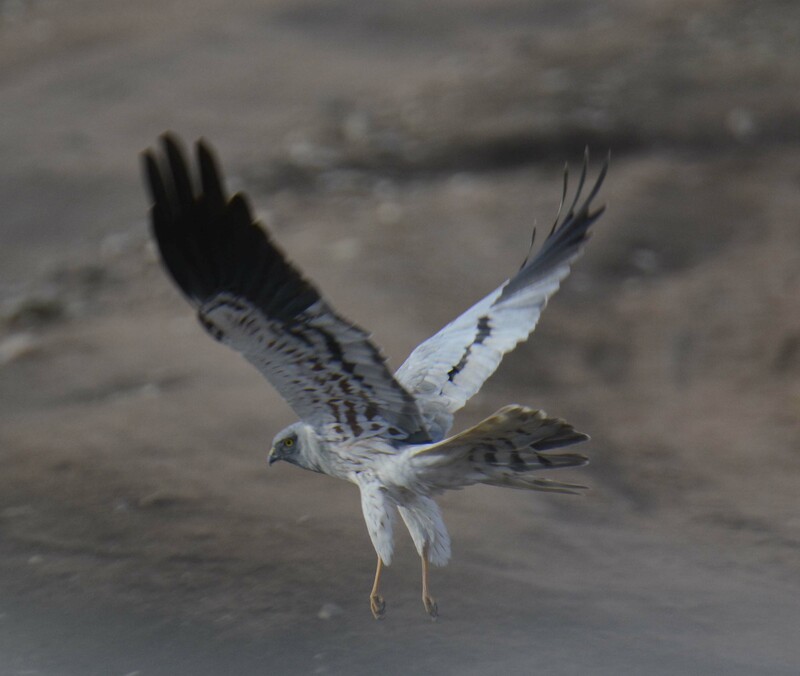 We were super excited as it really looked as though they were serious and we were going to see a kill, but they became disinterested, letting the stragglers through and then making their way across their way across the river towards some other animals. 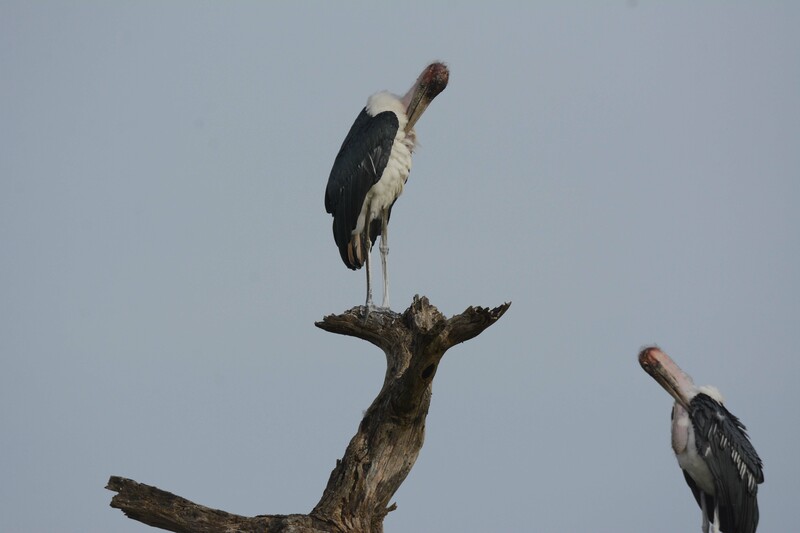 It was decided that they were not serious enough at the moment and, so, we moved on in the direction of Moru Kopjes. 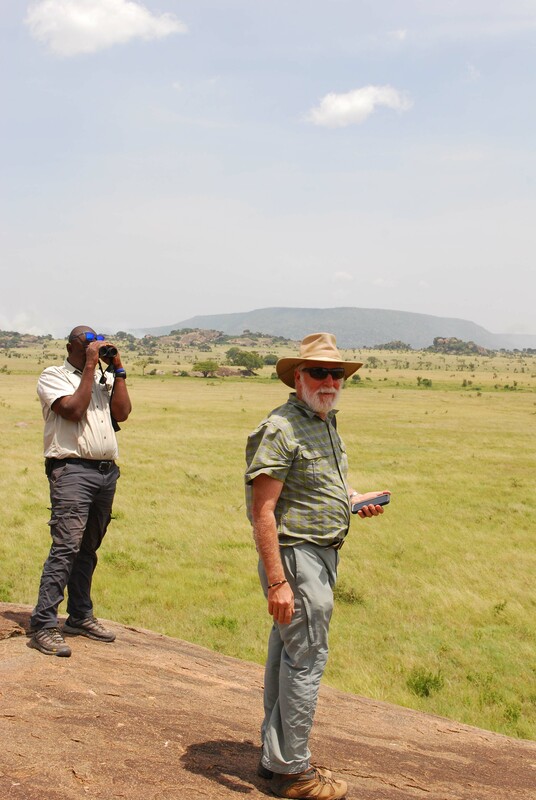 Vitalis had taken Kathy and me to the Moru Kopjes last year and they were some of the most beautiful landscape I had seen here so it was decided that we would go there again. There are black rhinos in this area as well, though we didn’t see them last year and struck out again this year, unfortunately. There was less wildlife there at the moment as the grasses were not optimal for the migration despite being very green and lush. The topography, though, made up for the lack of animals that were present here. 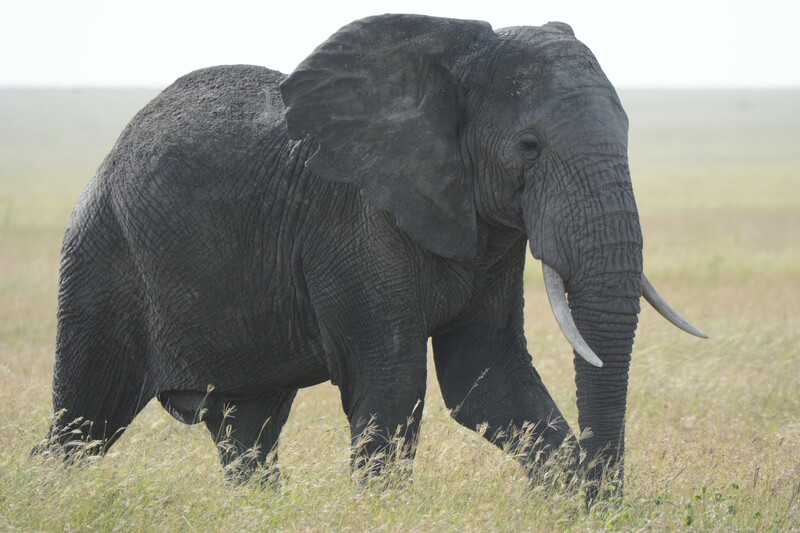 We did see some elephants very up close that were crossing the plain, much to Dan and Marin’s approval as they had missed our elephant escapades at Manyara several weeks ago and we could only see them from the distance in the Crater. 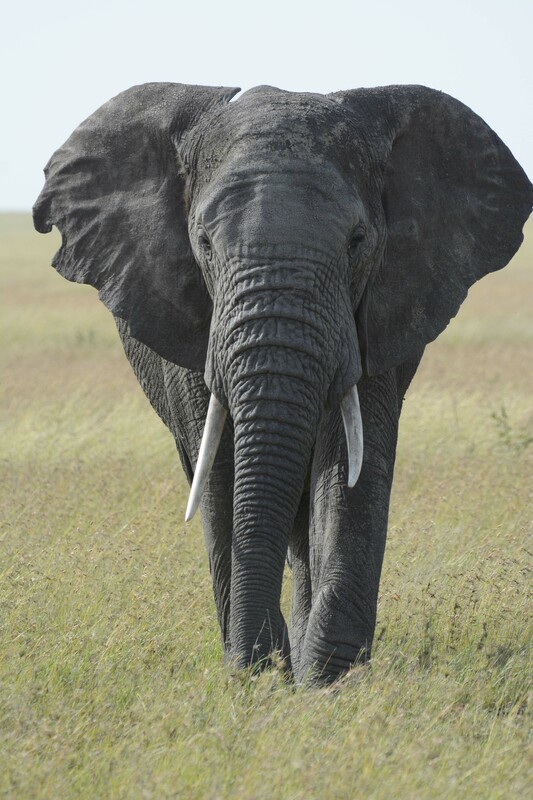 The elephants that we did see were three huge ones crossing the road around us so both of them had a great experience of seeing these amazing and huge animals up close and in person. 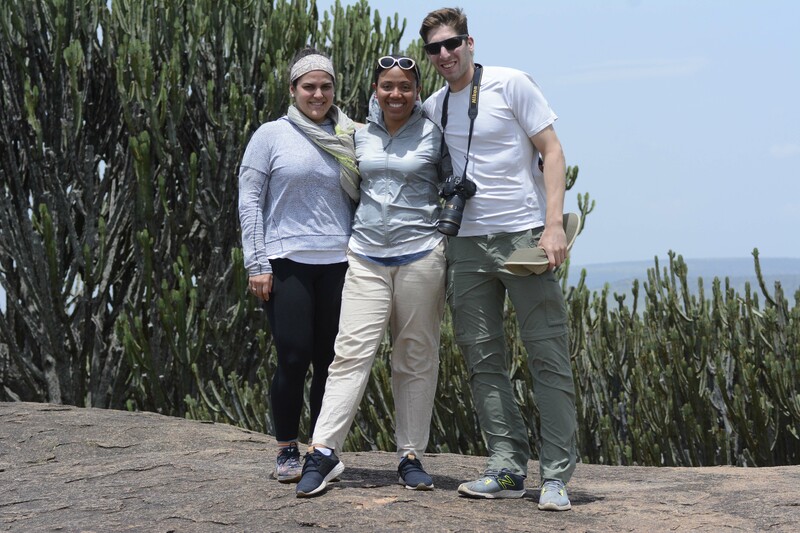 In the far reaches of Moru Kopjes, we visited the Maasai drawings and Ngong rock, two vastly different sites. The Maasai drawings are not ancient, but are drawings made by the Maasai who come to this spiritual site as part of their rituals of manhood that include the circumcision ritual (held every seven years for late adolescents and young men who come of age) and also when the men go into the wilderness alone for months to prove their manhood that previously included killing a lion, but no longer does. 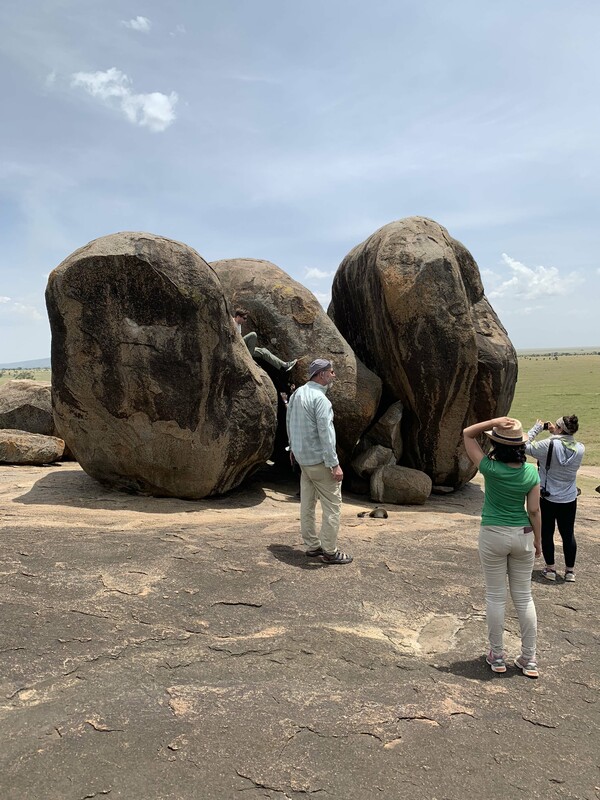 Ngong rock is a large boulder that sits atop the kopjes and when stuck with another rock makes a “singing” sound of hollowness that is different than any of the other boulders around. 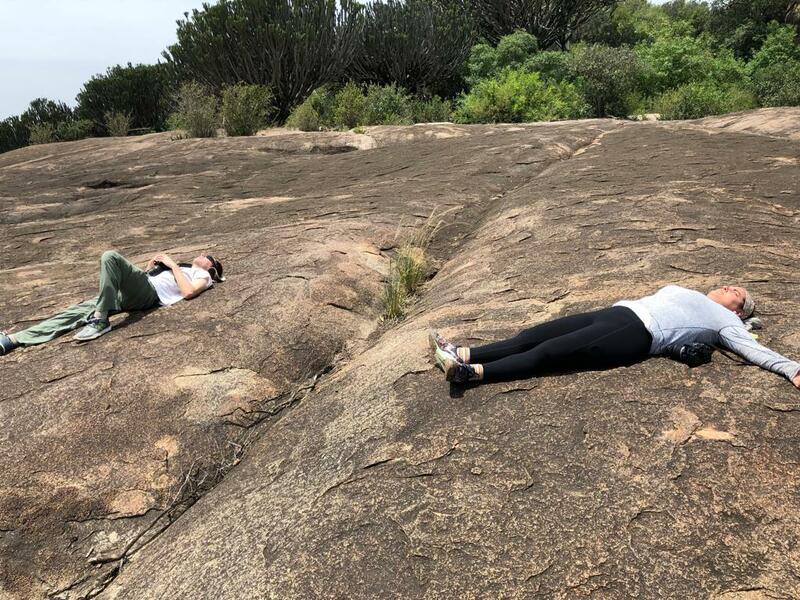 It is also in a lovely spot and we took every advantage of our time here to relax and explore the rock outcroppings. Jon clearly made the most of it, though, scrambling to the top of a large boulder and then finding it a bit more difficult to get down. Perhaps he had been inspired by the movie on free soloing we had watch last week or maybe he just had the urge “because it was there,” but either way, it was an impressive feat that no one else chose to undertake for good reason. From Moru Kopjes, we made our way slowly back to Naabi Hill to leave the park. 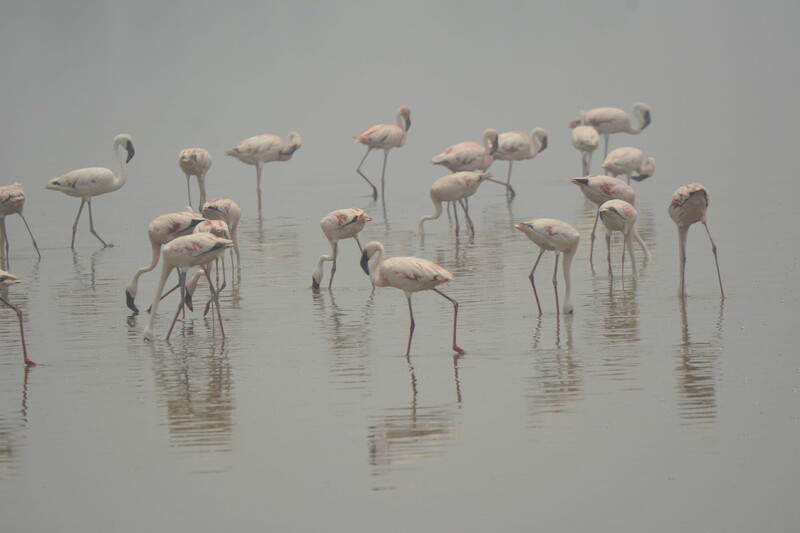 We would have lunch there which is a popular place for trips heading into the park from Ngorongoro as the distance is just right. There’s a small store there that sells cold soft drinks and, in the past, Pringles had been a big hit, but not so with this group. 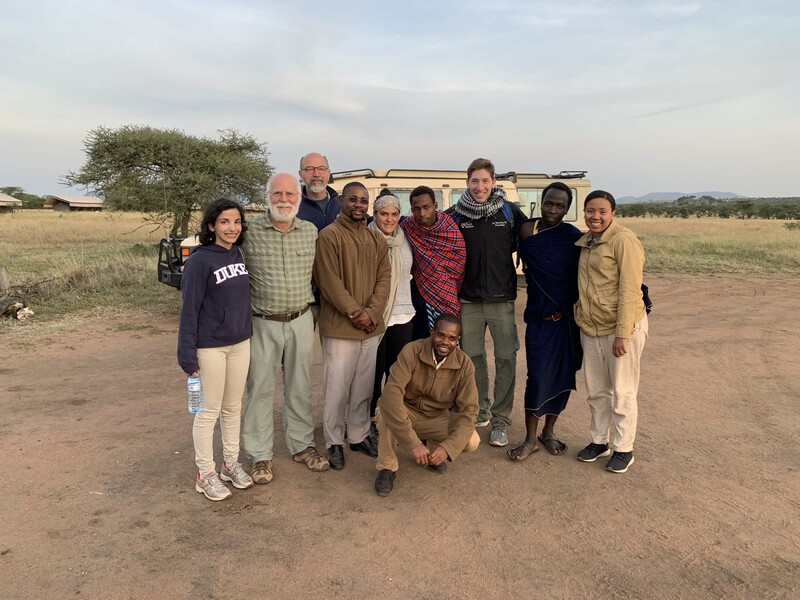 I took care of the payment to transit the Ngorongoro Conservation Area heading back to Karatu and after we had all rested up we were back on our way passing Oldupai Gorge and heading to the rim of the crater. 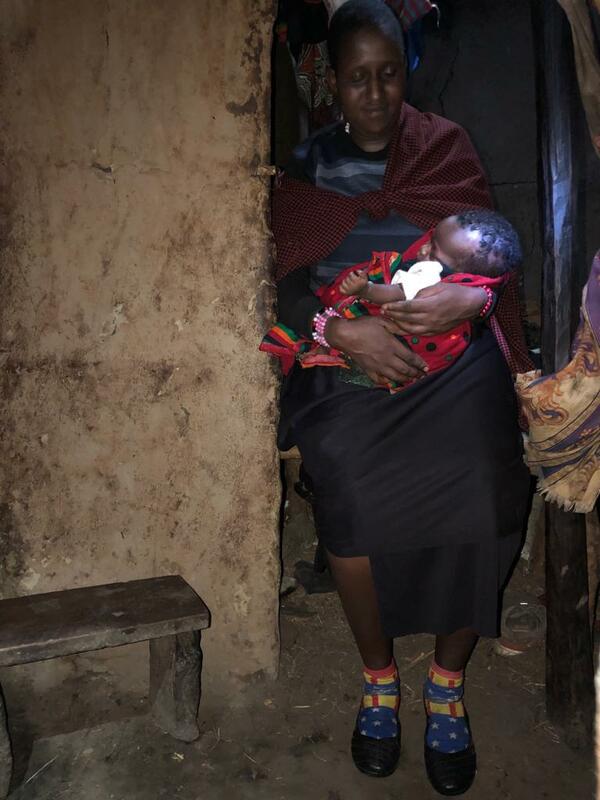 Kitashu, one of the two social workers at FAME, along with Angel, and someone who is exceedingly responsible for our neuro clinic to run smooth, is Maasai and his boma is just off the rim road at the turn off to Endulen, where there is a small hospital and dispensary. Kitashu had asked us to visit his boma if we had time and with this invitation, we had all agreed that it would be great to see him there. 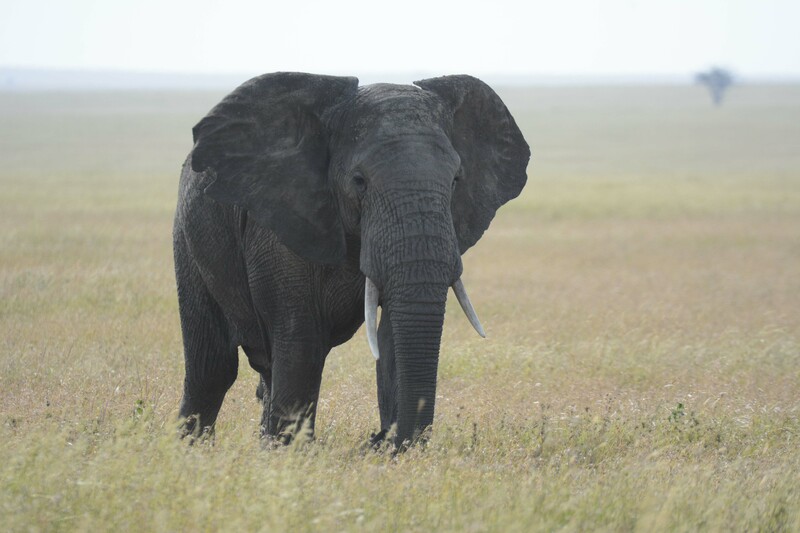 We called as we were close and he met us on the main road outside of his boma, which is actually a grouping of a number of bomas for his father and his brothers. Kitashu has one wife and now has a baby that is about a month old. 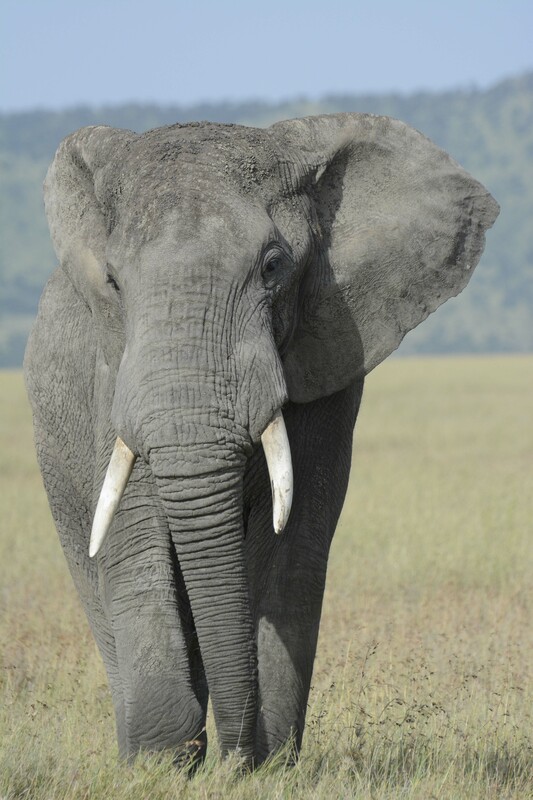 We drove along a winding trail between structures until we pulled into a small area outside his hut. He was dressed in his traditional Maasai clothing that he wears at home on the weekends and greeted us all very warmly as it was clear he was very happy to see us. What we had thought was going to be a short visit to say, though, was actually a formal visit with his entire family as I’ve been greeted in the past when visiting friend’s bomas. We were so honored to be there with his family, yet they were equally honored by our visit and, as I later discovered, we were the first of anyone from FAME who had visited him since he had been working there. 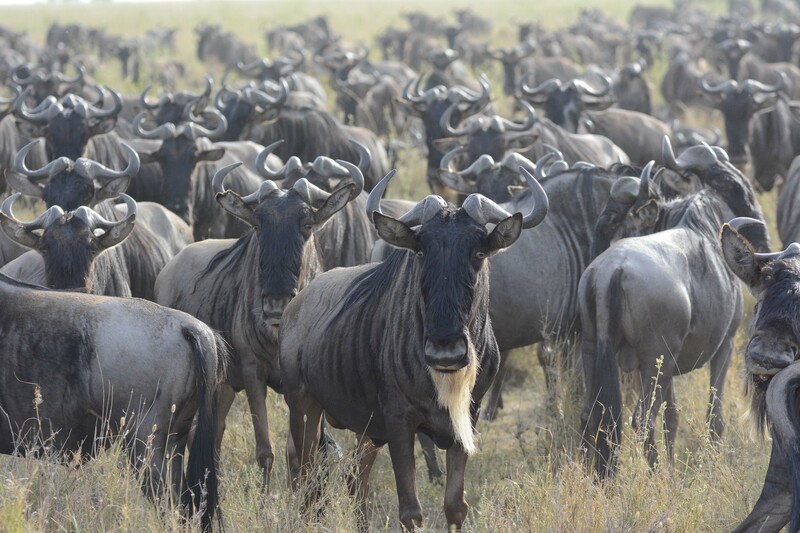 In all fairness, it’s a trek to get there from Karatu unless you’re also visiting the Serengeti or the Crater, but over this month, our group had developed a special closeness with Kitashu and, in the end, we were all so happy to have come. 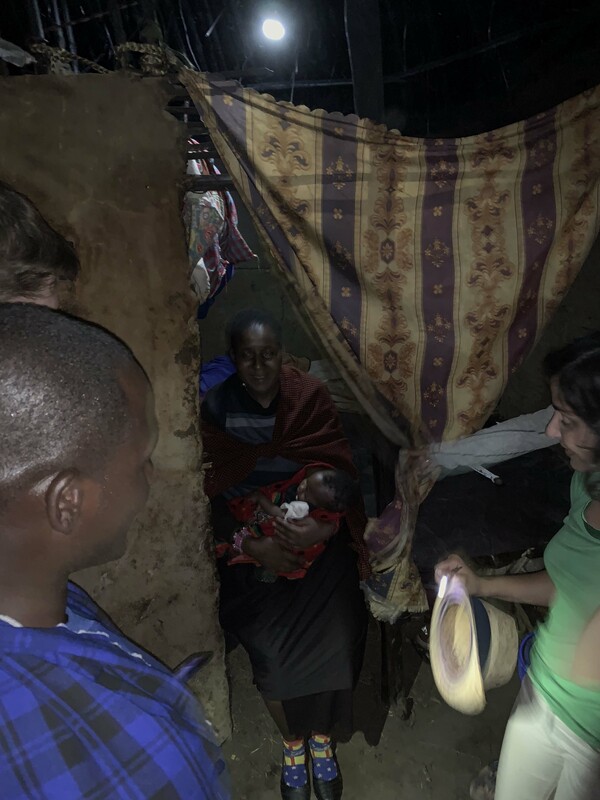 Kitashu invited us into his wife’s hut (huts are only built by the woman and belong to them) where we met her and their new baby. 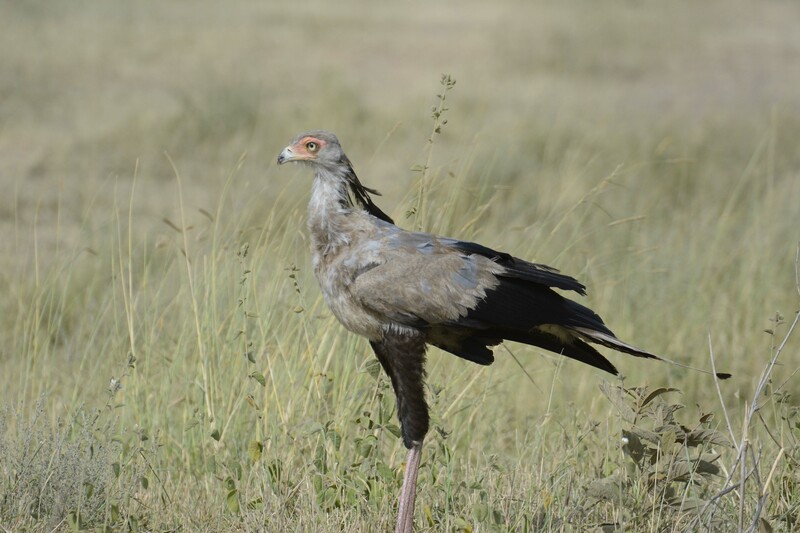 What I hadn’t known before, though, is that it’s tradition for the new mother to remain indoors after childbirth for a full six months and she is brought meals by other family members. 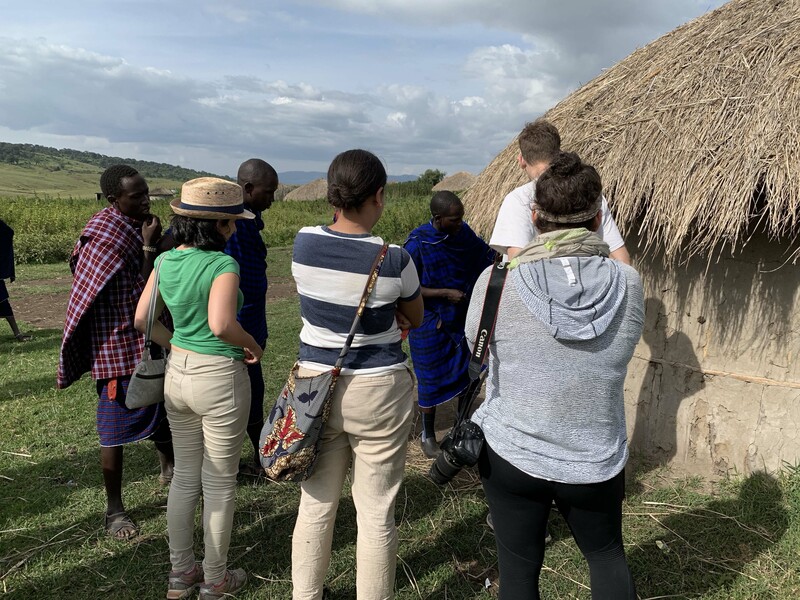 A Maasai hut is comprised of a center room of approximately eight to ten feet in diameter around which are found two other rooms, one for the husband and male children and one for the wife and female children. The beds are raised a few feet off the ground and are made of cowhide stretched over wood slats. There is also a room for kitchen goods and a small cooking fire nearby. The last parts of the hut are made up of the entrance way that leads to the outside and a large room for the goats to be kept inside at night (cows remain outside in a small corral that is surrounded by brush and wood. 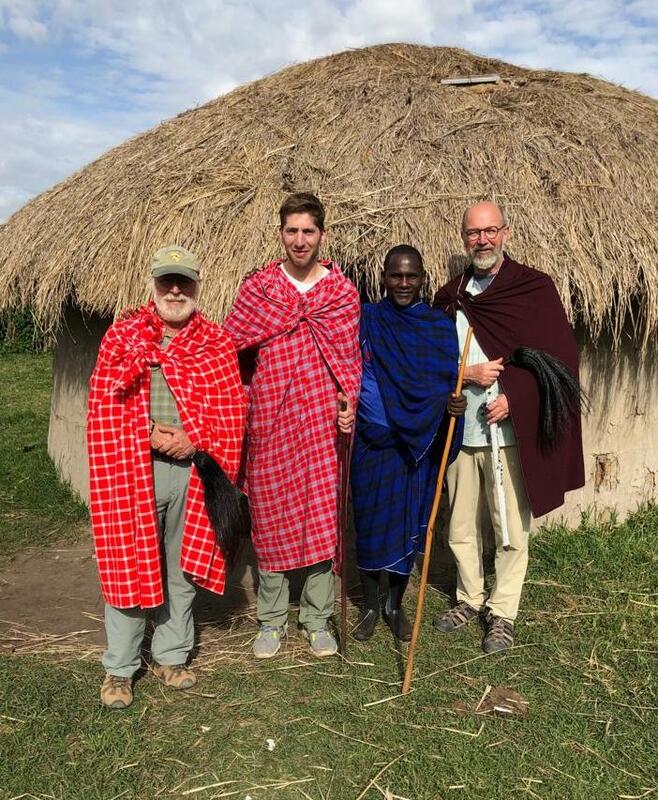 After visiting with Kitashu and his wife, his sisters-in-law lead Sheena, Adys and Marin off to one of their huts while Kitashu helped Jon, Dan and me dress in their shukas (the plaid cloth the men wear) in a proper Maasai manner. 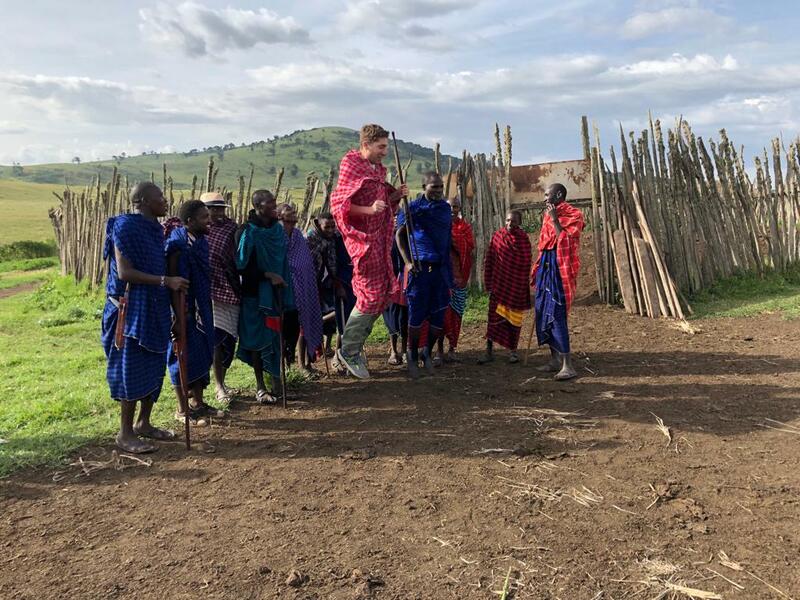 The woman later came out dressed in a bright blue cloth wearing lots of Maasai jewelry including the beaded collars that the Maasai women wear when dancing. The entire village was out to share in our visit and it became very clear to us that this was a big event for them. Kitashu’s brothers wanted to show us how they make fire using rod of hard wood that they place in a depression of a softer wood and then spin between their palms, handing the chore off to each other when they tire. They use their knives to make slits in the softer wood next to the little depression that collects the embers and then they are cut away and placed into some dry grasses that they’ve collected. They weren’t successful today in creating a big blaze, but I’m confident that if it had been a necessity, they would have continued until we had a nice little fire going. 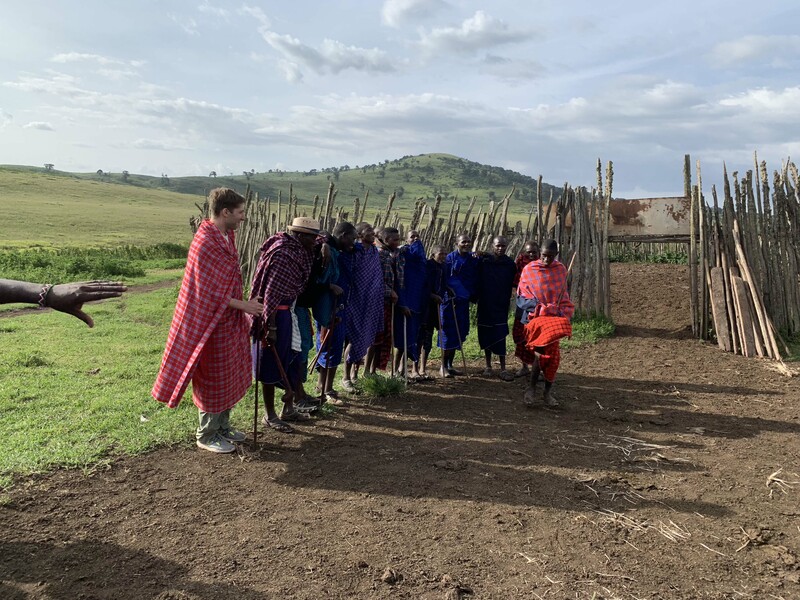 After the fire making demonstration, we all gathered in front of one of the cattle kraals where both the men and women lined up to demonstrate their dancing and singing. Sheena, Adys and Marin participated since they were in the appropriate dress, but of the men, only Jon was brave enough to participate in the traditional men’s dance that consists of repetitive jumping and stomping. I remember when I was here ten years ago with my children and visited one of the cultural bomas where they had also danced for us and my son, Daniel, had participated and had done quite well. Jon did great and though he didn’t reach the same altitude as Kitashu’s family members, he performance was quite respectable. I’m sure had I attempted in any way to join in the fun, I probably would have left the boma with some type of injury. Once the dancing was finished, we all made our way back in the direction of Kitashu’s wife’s hut and were led to one of the smaller kraals next to the hut that was full of tall stinging nettle, but there was enough of a path for us to make it to the center without injury. There in the center of the kraal was a small clearing in which they had prepared a goat roast for us which was totally unexpected. A goat roast is event that is offered typically to an honored guest or guests and is not something that is done routinely. Goats are not eaten on a regular basis by the Maasai, nor are their cattle as they are a measure of their wealth so it wouldn’t make much sense to be eating your assets as that wouldn’t be very sustainable. 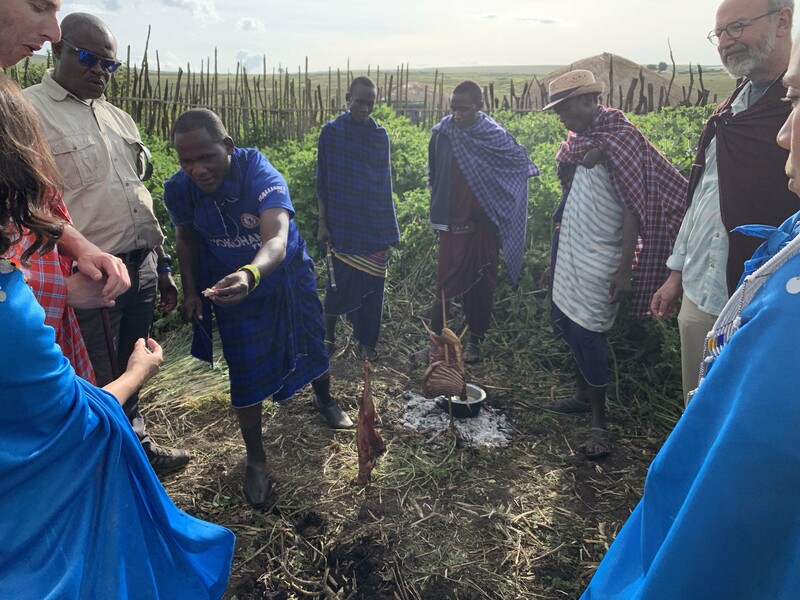 It was a great honor for us to be presented this goat by Kitashu and his family and as we all stood in the clearing while he sliced off piece after piece for us to eat, there was a clear sense of mutual respect and community that was shared by all who were present. The goat was amazingly delicious and tender and though it is cooked by the Maasai without any spices, there is a smokiness to the meat that comes from the open fire. We all ate piece after piece of the juicy slices and Kitashu kept going around the circle handing us more of more until there was little left and we were now enjoying the ribs. Though his brothers did share in some of the meal with us, I’m sure we devoured the majority of the goat meat that had been cooked. It was now getting very late as we hadn’t anticipated the incredible reception that we received and we were once again under the gun to get to the gate before it closed at 6 pm which would have meant finding someplace to sleep in the conservation area or otherwise trying somehow to talk ourselves out in some manner. We packed up the Land Rover with Kitashu planning to come back to Karatu with us. 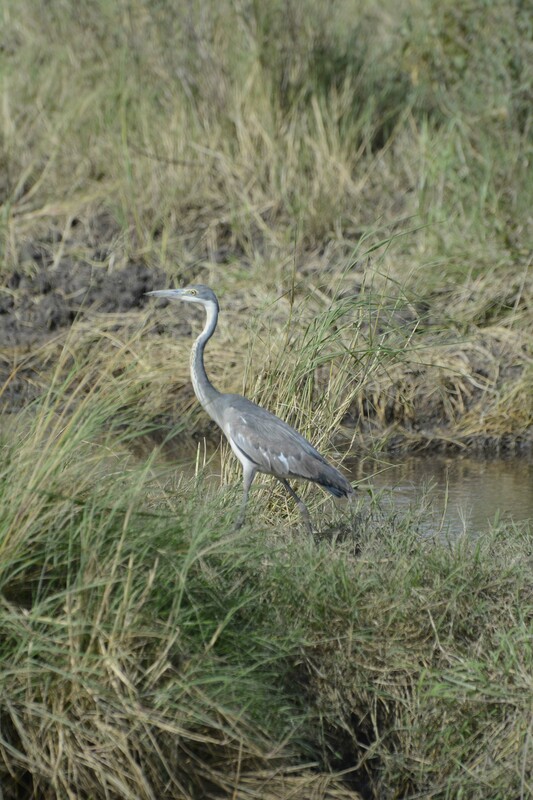 It had been a wonderful visit to the Serengeti over the weekend and it had been the last game drive for everyone today. They had all seen four of the Big Five animals of Africa (elephant, rhino, Cape buffalo, lion and leopard), missing only the last. 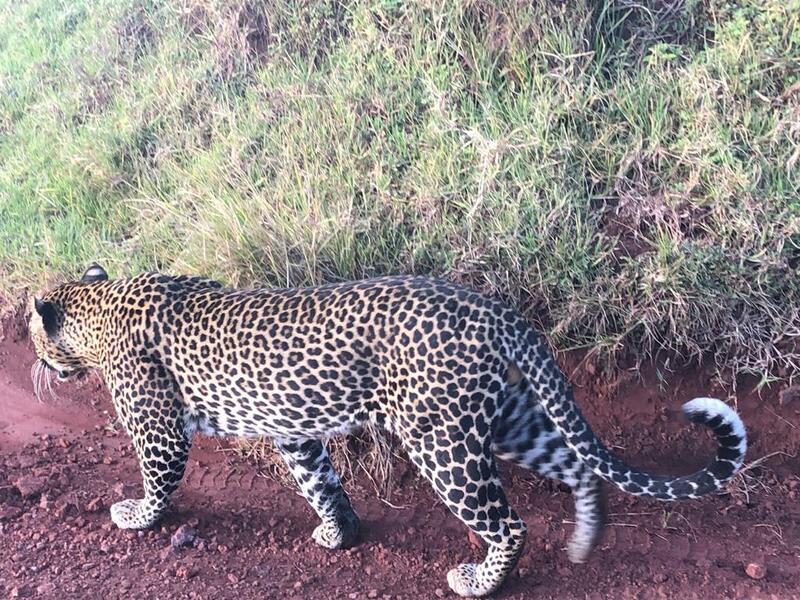 We left the boma and raced along the rim road heading toward the gate as fast as we dare, when suddenly, on the side of the road, there appeared a leopard walking. 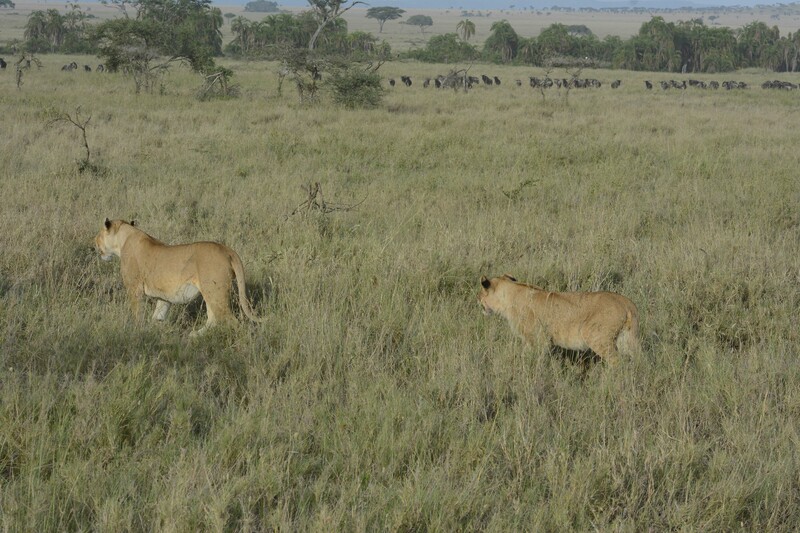 It was like magic, as if someone had decided that everyone couldn’t leave without seeing the Big Five. Regardless of how, the leopard remained on the road long enough for everyone to sure they had seen it and then it disappeared into the underbrush as mysteriously as it had appeared. 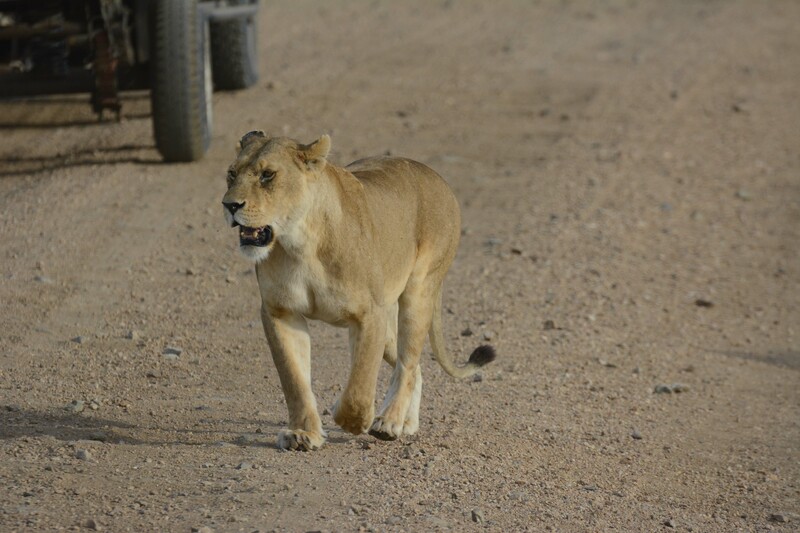 We made the gate with no time spare and waited while Kitashu took the paperwork to the office to check us out of the conservation area while baboons fought among themselves outside our vehicle, making a huge racket. 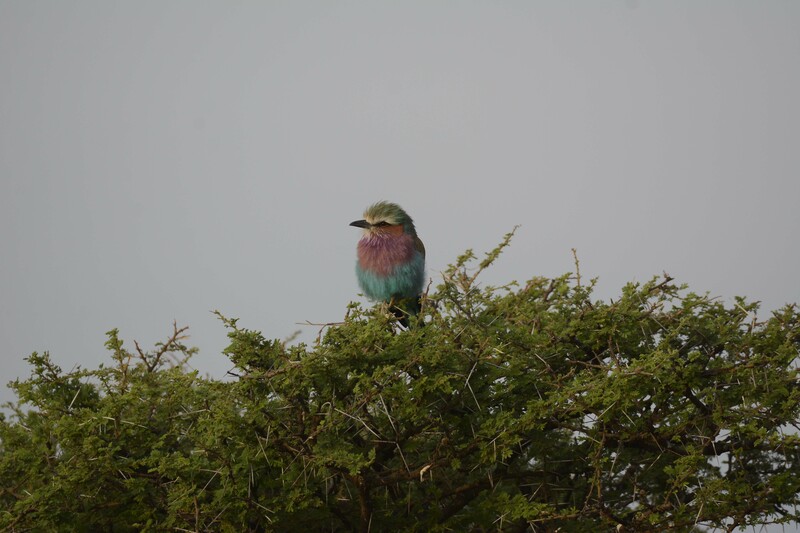 The leopard, the baboons and the race to the gate was a parting ending to our game drives for this trip to Tanzania. We dropped Vitalis off in Karatu to spend the night before heading home to Arusha in the morning (he actually planned to hitch a ride with Dan and Marin tomorrow morning as would be traveling early to the airport to fly to Dar es Salaam) and then ordered dinner from the Lilac Café as everyone was far too tired to cook. Dan and Marin would be leaving in the morning, but the rest of us still had four days left of clinic at FAME and were looking forward to it. 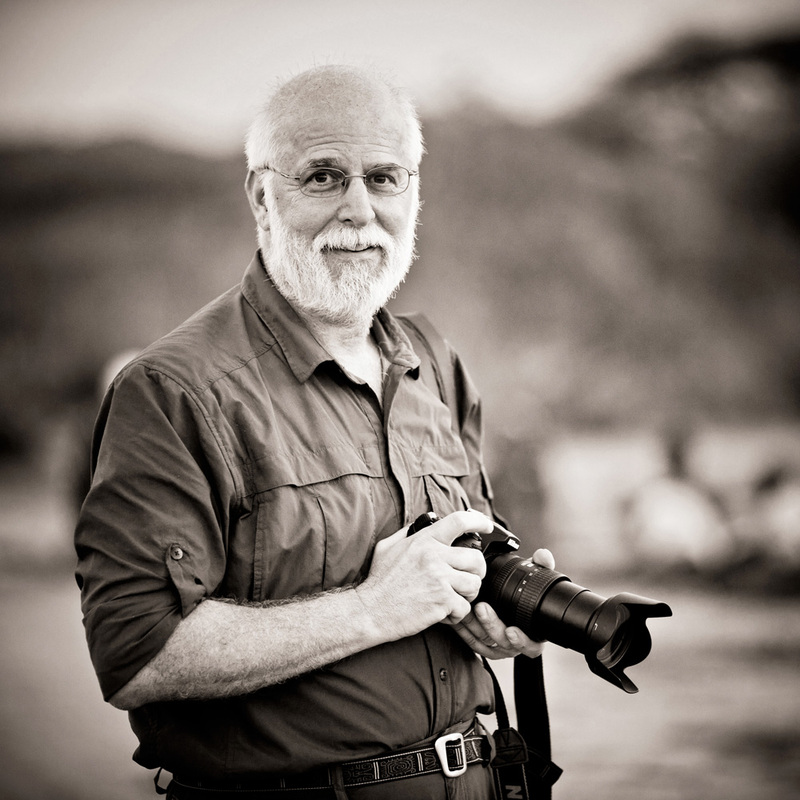 Saturday, March 23 – A very long day in the Serengeti…..